Earlier this month I was invited to attend the joint patient & researcher session at the UK CFS/ME Research Collaborative (CMRC) conference. This conference sounded really interesting, I was invited to attend for free and it was literally on my door step so it was a bit of a no brainer. To be honest I had no idea what to expect especially as I know very little about medical research in general, but I thought what the hell what do I have to loose and planned to go with an open mind (like I do with most things). On the day however I felt a bit tired but mainly in a can’t be bothered mood and was umming and ahhing whether or not to go, and a friend of mine with Fibromyalgia ended up calling for a chat. I explained to him my toss up between having an afternoon of lying on the sofa and watching Scrubs re-runs or going to the conference. Well he basically told me what a fantastic opportunity it was and how I would be silly not to go, and that he would kill to go to something like it. So off I trotted and I am so glad I did. Research is the attempt to derive new knowledge, including studies that aim to generate hypotheses, as well as studies that aim to test them. How can sufferers and the public help contribute to research? Due to our a wealth of experience in living with the condition, impact of side effects and practical issues such as cost and availability of treatments including us in research is crital. 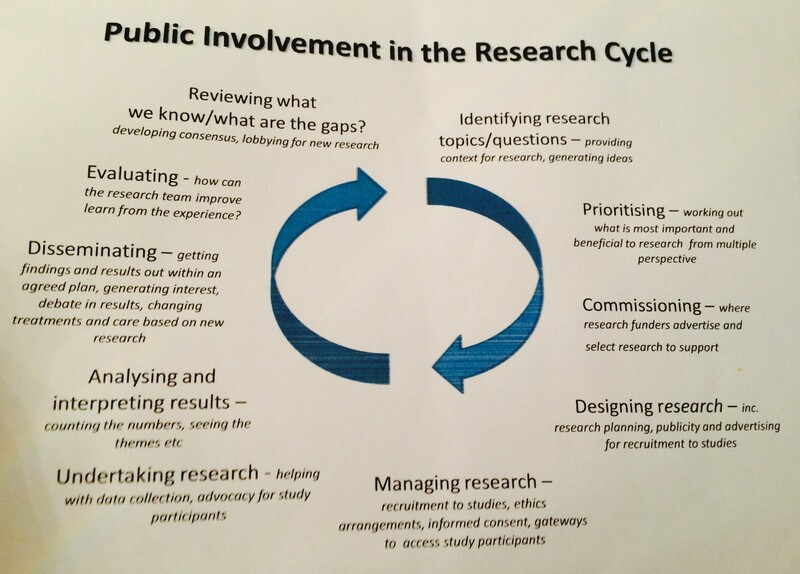 We were arranged in groups of around 10-12 each group, the first exercise of the afternoon was to discuss our views on the research process within the context of CFS/ME, using the ‘Research Cycle Diagram'(see diagram below) as focus point. Our group contained a mixture of people, from long term suffers, relatively newly diagnosed like myself, carers, researchers and a one of the producers of Canary in a Coal Mine, a feature documentary currently being produced about ME/CFS (Link). Why pregnancy often causes symptoms to cease? Making info available to public in a way they can understand. Clear information on how to get involved with research. 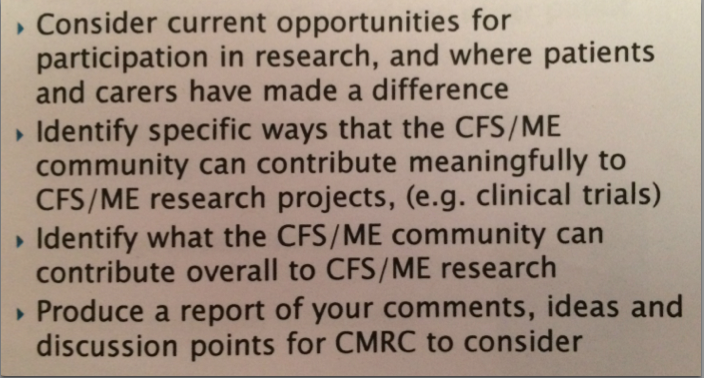 Problem with perception of CFS/ME as it currently has a low priority status. Corporation to do economic research independently. I am very grateful to you for both attending this conference session and compiling this with thorough account was what was discussed and agreed. What sticks out to me, as an older long term patient is firstly the list of research priorities. It appears to be written in language that an average PWME would not use (in some cases), it doesn’t include any treatments (we need clinical trials of ME treatments in the UK) and it makes some strange assumptions (like fatigue comes from the brain). I am disappointed that an opportunity to have a frank, honest discussion about UK research, the options and the barriers seems to have been lost. The priorities to me seem either too specific, too woolly and the lack of specific treatments as a research priority is a major problem for me. As you may be aware the charity IiME are raising funds for a treatment trial using the drug rituximab. This is just one of the drugs being used worldwide in a research setting to treat CFS. There are other drugs being used, particularly in the USA, by doctors to treat the disease. We have no access to these drugs in the UK. Why was this not a top priority of the research list? Why was then no mention of exercising testing (as per the Pacific Group), good day/bad day testing, immune system after exercise (as per the Lights) or any of the other quality research projects being carried out in the USA and needing replication here? 1. That patients were exhausted by the previous lectures before they go to this part. I don’t know if I could have sat through this and managed to get a thought together after that. Would you be able to shed some more light on this or comment further please?